“How to advertise my business” is the question that most small businesses are asking. Unlike large, national companies who have a near-unlimited advertising budget, small businesses have to research heavily, evaluate and decide which type of advertising is suitable for their business and, more importantly, is the most cost-effective. Small businesses simply cannot afford to waste their budget on the wrong people, at the wrong time; it has to reach their desired target audience in the right mindset. With so many advertising options available to small businesses, it’s no surprise that business owners are left scratching their heads. Online advertising, social media, press, radio and outdoor – the list goes on. Clear Channel Direct was launched in 2014 with a focus to help small-to-medium sized businesses grow and, since launching, has worked with thousands of organisations, enabling them to advertise locally on billboards, bus shelters and various sizes of digital screens. Clear Channel’s range of outdoor advertisement panels primarily includes bus stops and billboards. 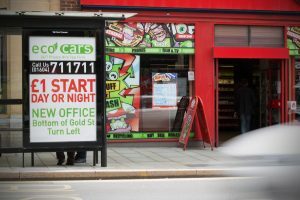 However, the portfolio also includes Asda, Sainsbury’s, phonebox advertising, digital screens in petrol stations, bars and shopping centres. Outdoor advertisement is an unavoidable, 24/7 medium which simply stands out and unlike other media; you can’t turn the page or change the channel. Advertising Out-of-Home is not only cost effective but it’s completely efficient. With outdoor, it’s very easy to reach specific audiences such as families, commuters, sports fans and students. You can even target your competitor! This ensures that budgets are not wasted by placing ads in the wrong places, reaching the wrong audience. Digital outdoor advertising is on the rise and it’s fair to argue that Clear Channel is leading the way. Digital Out-of-Home allows businesses to book by specific times and dates which enables organisations to entirely focus their budgets on their target audience like they’ve never done before! There are a variety of ways that you can use outdoor advertising. Whether you want to promote an upcoming sale, strengthen your brand locally or simply drive people into your business, outdoor can make this happen. For example, if it’s a sale, you could book a few of our prominent billboards located on the major arterial routes into your town ensuring that your brand receives maximum exposure, informing everyone local about your offer. A common issue that a lot of small businesses face is their location; they’re often located around the corner from the high street or somewhere difficult to find unless you already knew that they were there. A simple, yet powerful solution to this problem is ‘directional advertising’; book a Clear Channel panel for a long period of time with an arrow pointing in the direction of your store, directing new business to your doorstep. Don’t take my word for it. Watch Clear Channel’s video testimonials and read their client’s success stories. Hear how small businesses have achieved local fame through outdoor advertising. 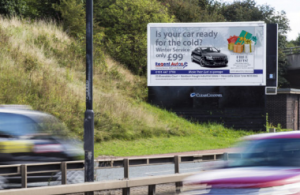 Directional advertising: Local garage in Gateshead, Regent Autos chose a specific billboard which was located in a prominent location to direct drivers to their business. Results – increase is servicing and MOT enquiries. Watch Regent Auto’s video interview.